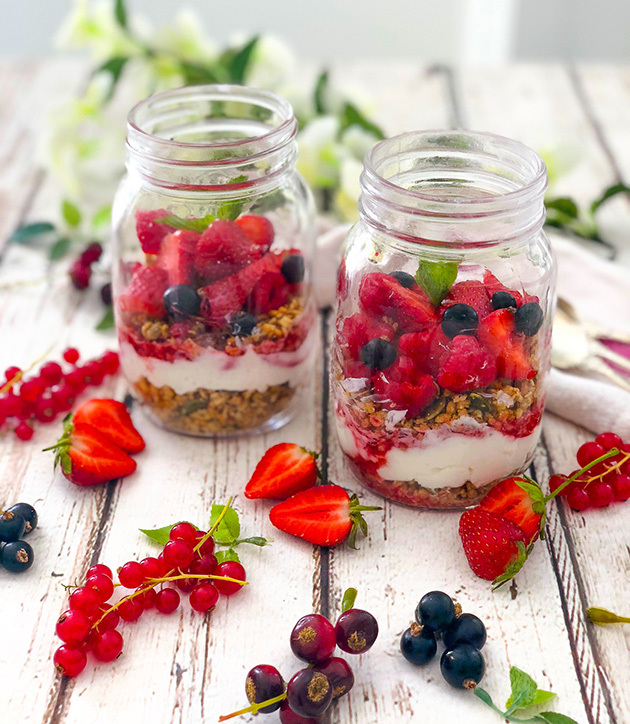 Strawberries and raspberries work really well together and the addition of the redcurrants, makes this breakfast a delicious – and portable – start to the morning. Recipe by Lindsey Fosker from Eat Unique. The good thing about preparing food in a jar is they are portable, so perfect for breakfast on the go. I normally make up much more compote than I need when the berries are in season, then freeze, ready for the colder months. These breakfast jars can be made up the day before, store in the fridge overnight. Makes 5 small jars. Serves 2-4 with yoghurt & granola. Heat the strawberries on a low heat for around 8 minutes, stirring occasionally, add the raspberries and redcurrants. Continue to cook for another 4-5 minutes, until all the fruit has completely softened. Stir in the honey, cook for another minute, remove from the heat. Check for taste and add a little more honey if you need to. Leave to cool, while you prepare your jars. Add another layer of granola, compote and then finish off with a few sliced strawberries, raspberries and a sprinkle of red and/or blackcurrants. Add a sprig of mint for decoration! If you have made up extra berry compote for freezing, leave to cool completely then transfer into small glass jars or ice cube trays and freeze. Lasts up to 3 months frozen, or 4 days in the fridge. Huge thanks to Eat Unique for devising these delicious breakfast pots, and making our fruit look so beautiful! Check out her website – full of healthy and delicious recipes using unrefined and seasonal ingredients.